It definitely won't be news to my regular readers that I have an undying love for all things Kimono, and as each week goes by it seems that my collection just grows and grows! But I don't just buy any old Kimono, no no no! I look for the ones made with gorgeously floaty, feminine fabrics and dreamy prints. I just love the versatility of them and could easily wear Kimonos 365 days a year. I remember using tinted moisturiser quite often during my teens, it might take some effort but try to think back to the days when Nivea had just two shades. Two shades! Oh how the industry was lacking back then. That might not sound quite so odd being that I'm Indian, but as a youngster I absolutely hated the stuff. I think that was probably down to the fact that nobody in the family could do it properly at the time, so I used to end up with two big brown circles on my hands. They were meant to be the Sun. Oh and also the scent that used to linger once the mehndi had developed into it's rich brown shade. Hasn't Ramadhan just flown by this year? I guess we say that every year though, time marches on endlessly and if you look away for just a fleeting moment, you'll find days or weeks have passed without you realising. Perhaps the delerium of working in a non-AC building in 30C temperatures without food or water for 18 hours each day played its part, but at times I felt like I was that car in the music video for Snow Patrol's 'Open Your Eyes' - drifting around at high speed in a bit of a daze! Ok, so not the conventional way to start a post but what I'm referring to is the brand Drop Dead, I'm not telling you to drop dead! And you know, I've been really liking their outerwear lately. The colours and the prints have drawn me in. Fake Bake Bronzer Compact + Kabuki Brush = FACE CONTOURING! I've been such a slacker lately! I've been neglecting the blog a little as Ramadan has really taken its toll this month, but believe me I have so much to talk about! The problem is, after a hard days work in this unusually sizzling hot Summer, I've been getting home around 5ish and heading straight for bed! In fact, I've been struggling to keep my eyes open on the way in to work too! Anyways, over the past couple of months I've had a fair few peeps ask me about how I contour and what products I use? Up until recently I was using Sleek's Contour Kit, however Fake Bake sent me their Bronzy Babe Bronzer Compact and Bronzing Powder Brush and they've really impressed me. 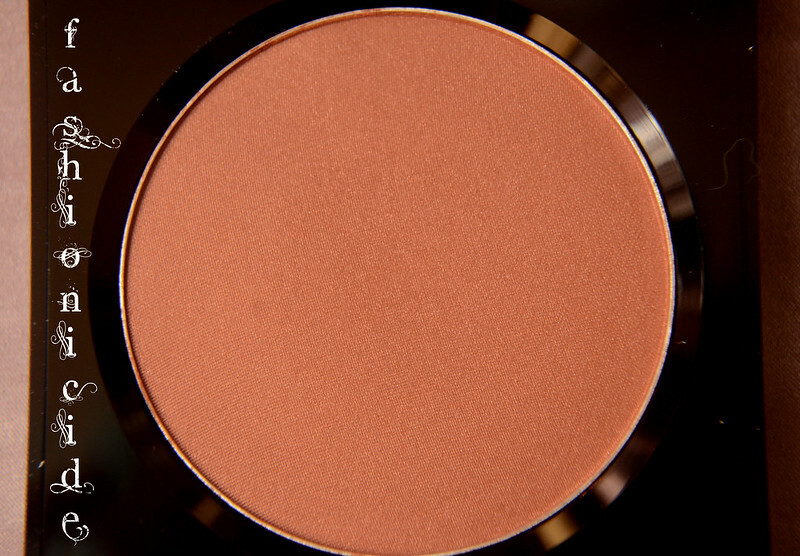 The Bronzing Powder Brush is essentially a Kabuki brush. Now I love my Body Shop Kabuki which is just ridiculously soft! However, the big issue for me is that it isn't really convenient or hygenic to carry around with me in my bag. Fake Bake provide a cap with theirs, so once you're done with it, you can cover up the brush and pop it in your handbag! So, after that little confession, on to the bronzer! The casing is leopard print on top and contains a mirror inside. I've never liked leopard-print, there's something very Kat Slater and tacky about it so that immediately put me on the back foot with it. But, as the old saying goes, you should never judge a book by its cover - no matter how garish that cover may be. I don't know about you, but I find it so disheartening to hear folk we come across in our daily lives judging others based on appearance. There's so much more to people than the way they look! Well anyway, I wasn't about to judge this poor little thing on it's cover, I wouldn't want to hurt its feelings! "Bronzy Babe bronzing powder has triple pigmentation which means that, you need use less, it looks fresh and stays put for longer and in a generous sized compact with mirror, it will last for ages"
As you can see, after all the buffing, it still looks pretty apparent I've applied a bit too much. With that being said, using this with Illamasqua's Blush Up Brush, it's perfect! With the Illamasqua brush, I find I have more control over the pick up of the product and the shape of the brush fits perfectly under my cheekbones. I'm no expert in contouring, but I'm sure I'll get there eventually. I don't get all that much practice as I find that under my cheekbones it's quite hollow anyway, but a light dusting with the right brush really defines them- we're onto a winner! What with all the heat just now, I'm using the Kabuki for some desperately needed daytime powdering! I couldn't find the Bronzer on the Fake Bake website, but I have managed to find it on the Hair Trade website for £15.99. The Kabuki can be found on the Fake Bake website and will set you back £9.99. Would I purchase the bronzer when it runs out? I think I'm on the fence about that, it's really long lasting which is a huge plus, but it is £15.99 and the Sleek Face Contour Kit costs just £6.49. I guess it comes down to whether you want longevity, and how much you're prepared to pay for it. If £15.99 is no big deal for you, bag it! Have you used Fake Bake? What did you think? Any tips for a budding contourer like myself?